The time of mass marketing campaign in mobile business has gone forever. With daily information overload, users have neither time nor patience to deal with generic marketing messaging. In fact, mobile users expect a curated and individualized experience with an app. Furthermore, they are quite open to trade behavioral data and share some personal data if it assists in providing greater relevance in the information they receive from the business. Personalized messaging helps business nurture relationship with its customers and improves user engagement and retention. Every app has its “invisible” user base that enjoys the app, explores its functions, browse for products/services, but does not convert into business customers. Based on behavioral data, in-app personalized messaging enables to engage with your users in a meaningful way and encourage them to make a purchase, sign up for an account upgrade or any other action your business need. For instance, if you need to increase premium account subscriptions, you can target pull of users that have been engaging with your app on a daily basis for the last month and offer them free premium experience for two weeks in a custom-tailored in-app message. Customers would definitely appreciate getting something that can actually enhance their user experience in the app they obviously enjoy and the chances that they would agree for paid subscription, later on, are high. Mobile app market is getting more competitive day by day. If you have passed the first hurdle of acquiring users to your application and turning them into customers, the worst business can do is to let them ride the wave by themselves and eventually to drop off in favor of your competitors. Creating custom-made campaigns and delivering it directly to users with in-app message brings them back to the app, push the right buttons of app users and get the result that business needs. With personalized messaging business can treat customers with strong buying power with VIP offers, letting them know how important and valuable they are. Besides, keeping the engagement up and running on a one-to-one messaging basis, a business can build close relationships with users and turn them from customers to business “fan base”. This category of app users can actually increase app social sharing, provide free PR and positive feedback and, ultimately, help business to bring more app users. At the end of the day, word of mouth marketing is the shortest way to make an app go viral. Besides keeping conversion and user engagement rates on a high level, it is important to always improve mobile application. 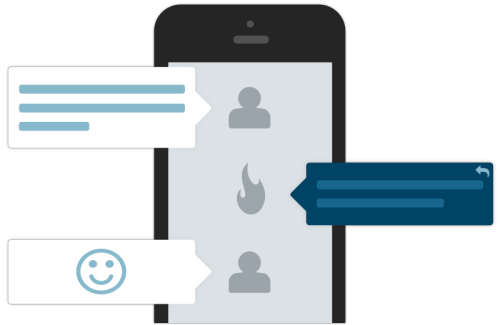 In-app personalized messaging is an efficient way to collect app/product/service feedback and improve your app before negative app ratings would appear on app store. For the last few years, mobile industry has been talking the talk of personalized marketing. Sadly, a vast majority of mobile businesses has not walked the walk to the full extent, admitting that they are lagging in the personalization department. However, personalization revolution in app marketing is just around the corner and mobile business will be soon forced to play catch up quickly. With the rise of tech startups dedicated to empowering marketers with effective solution that supports in-app personalized messaging, business is able to customize almost all aspects of communication with every customer. If you haven’t get personal with your app users yet, check out the available solution on the market. Our solution is a one-stop solution combining the functionality of in-app help desk, user analytics, and marketing platform. Find more information about Helpcrunch here.